Tired of inconsistent primer ignition? Want to avoid re-facing or welding you hammer face? Want a smoother more dependable replacement? Just announced by TK4B Enterprises, LLC. is a newly designed and developed Firing Pin especially for those TTN aficionados in the Classic Cowboy category. 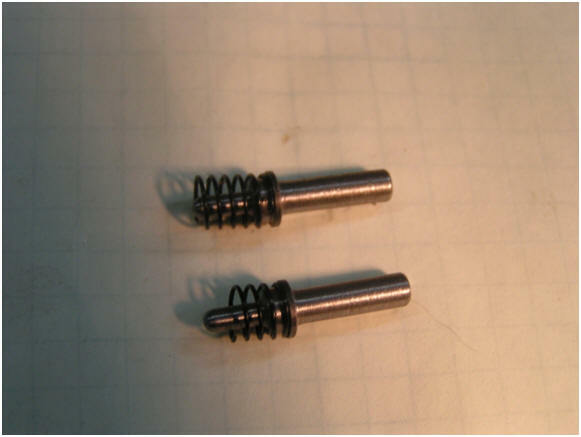 The SliXPin is designed to replace the shorter, and most times bent, existing firing pin. Field tests by local TTN shooters over several weeks and multiple shoots have proven the SliXPin will improve primer contact and will adjust for the worn and cratered hammers in the side-lock action. Most of the test shooters discovered they did not have to re-face their hammers, that the extra rear length provided the necessary dimension for continued consistent firing. Like most of TK4B products it is manufactured with proprietary metal stock to ensure a long lasting improvement. The SliXPin is further designed to be as close to a ‘drop-in’ unit as possible to the point of being able to use your existing spring. . Inappropriate installation procedures can destroy or reduce its effectiveness. Because there are so many different tolerances and dimensions between production runs and even individual shotguns, this may not be a totally a drop-in replacement. Although we have watched adequate gun repairmen correctly install the pin, if you have a little experience with working on them go for it, but we encourage you to contact your local smith or tuner. The only critical issues while installing the SliXPin is are to cut about 1-1/2 to two coils from the bottom of the original spring and be certain that the top end, or smaller diameter coil, is fit over the lower shoulder on the Pin before inserting into the frame. See the picture above to get an idea of the proper fit and spring length. The manufacturers want to clearly point out that if you have little or no idea how these springs are supposed to fit and work, get help or find someone who does know how to install them. Due to all the variations in machining tolerances, this is not a “one-size-fits-all-perfectly” drop-in set. It may take some individual fitting.